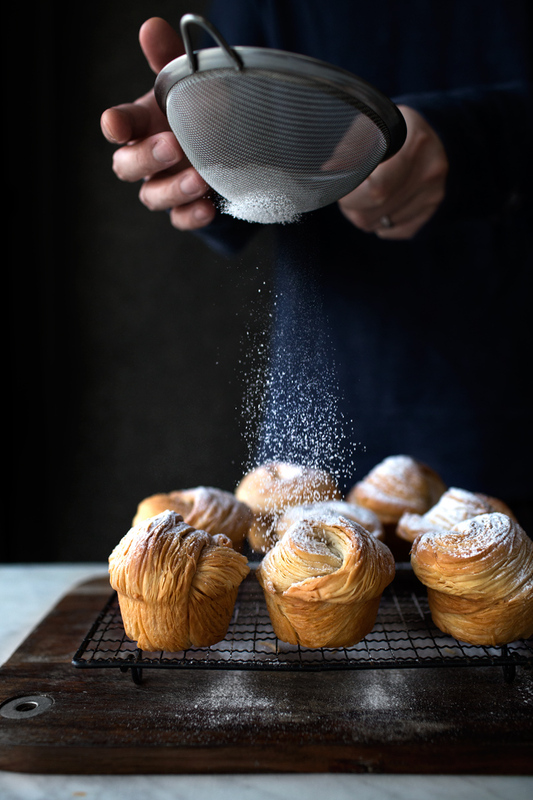 ZERO folding, absolutely no chilling in between, UTTERLY FLAKEY AND SHATTERING CRUFFINS (croissant + muffin = it’s a thing) MADE WITH PASTA MACHINE ! I don’t know what else you need to hear about it. Seriously. Go now. Do it. 2 hours before starting the dough, leave 165 grams (11 1/2 tbsp) unsalted butter on the counter for it to completely come to room-temperature. In a stand-mixer bowl with dough-hook (or large bowl with hand-held mixer with dough-hooks), whisk together bread flour, all-purpose flour, instant dry yeast and salt until even. Add 130 grams of luke-warm water (around 95F/35C) and knead on low speed for 3 min. The dough should be slightly shaggy and stiff, but if it has difficulty coming together, add the additional 30 grams (2 tbsp) of water and knead again. Then add 50 grams of cubed, unsalted butter and knead on low speed for 5 min until completely incorporated. Then increase to medium speed and knead for another 10 ~ 15 min until the dough is extremely smooth and elastic. Cover with plastic wrap and let rest for 40 ~ 45 min at room-temperature. It should expand slightly. Transfer the dough to a lightly floured surface, and divide into 4 equal portions. Work with 1 portion at a time and cover the rest loosely with plastic wrap. Dust the dough with just enough flour so it doesn't stick, then roll it into 1/3" (1 cm) thickness. With a pasta machine at its thickest increment, feed the dough through the machine once, then feed it back again but this time, overlap 1 end of the dough over the other and run the seam through the machine so it sticks/connects tightly together. 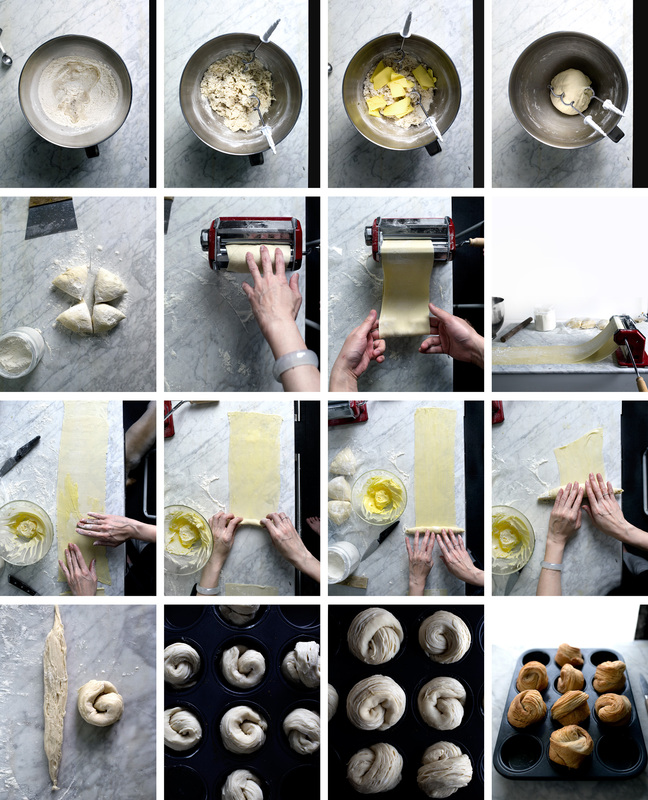 You should have a continuous ring of dough going through the pasta machine like a conveyor belt. This saves you the trouble/time of re-feeding the dough back into the machine after each increment. Now dust both the inner/outer side of the dough with a bit of flour, then start running the dough through the machine, continuously, until you reach the thinnest increment (should be paper-thin). Gently avoid any crinkling or folding of the dough during this process, laying it neat and flat on the counter. Now cut the dough loose where it's close to the machine, then run to release the dough from the machine. The dough will be very long, so you may need to cut it in half, and keep it unfolded and laid flat on the counter. Now with your fingers, gently rub a thin layer of the room-temperature butter (has to be very soft but NOT MELTED) evenly across the dough, extending all the way to the edges. Do this to both sections of the dough if you had to cut it in half. Just keep in mind that this is a 1/4 of the entire dough and you should use up 1/4 of the butter. Once finished, start rolling the dough from one end to the other, as tightly as you can, into a firm log. Place the log on one end of the other buttered section of dough, and roll it up again. Now, cut the log in half length-wise with a floured knife, then with the cut-side facing outward, twirl it into a semi-knot and tuck the ends underneath itself (*do not make them too tight, because they need a bit of room to expand*). Place the knots inside buttered muffin-pan. Repeat the process with the other 3 portions of the doughs and butter. If you are doing this the day before, you can wrap the entire muffin-pan with plastic wrap and leave it in the fridge at this point. If not, cover the pan loosely with plastic wrap and let proof at room-temperature for 2 ~3 hours until fully doubled in size (it may need a couple hours more if it was chilled before hand). Bake in a preheated oven at 400F/200C, for 25 min until puffed and golden browned (I didn't bother with egg-wash because they are gonna be dusted with powdered sugar, but you can if you want). Let cool slightly on a cooling-rack, then dust with powdered sugar. Strongly recommend measuring the ingredients by weight. This recipe lands slightly on the savoury note. If you want it to be sweet, reduce the salt to 1/2 tsp, then add 2 tbsp of sugar to the dough-mix. Then instead of powdered sugar, you can roll the cruffins in sugar all around. OMG Mandy. I never thought I could want a pasta machine however the thought of not trying this would be a sin! Seriously I love your culinary skill and thank you once again for bring a bit of carb happiness to the world. Wow I never thought I could use a pasta machine that way! I can’t wait to try this out! do u think spreading chocolate on them before folding would work? Emma, i think you will have to do it very sparingly, or you’ll end up with way too much chocolate? I’d maybe roll a strip of chocolate or some crushed chocolate bar in the middle of the first roll and call it good. AGH wish i saw this before baking these! Pain au Chocolats are my favorite and I feel like these are a little lacking, though I have made croissants before and that is my comparison. Next time I will def be microplaning some chocolate onto them. Genius! I am making these ASAP! Beautifully written precise, well executed recipe! Makes me want to pull out my old pasta machine. OH MY GOD. This is genius! I can’t wait to try this, but could you explain what you mean by “Place the log on one end of the other buttered section of dough, and roll it up again”? I’m having a hard time visualizing what to do after rolling it up the first time…. Joy, sorry for the confusion. So because the rolled out dough is very long, mostly like you won’t have enought counter space. So you cut it in half, butter both “sections”, then after you roll up the first section, just place it over the second, and roll again. Does that make sense? No, absolutely not. Heritage wheats are not tolerated by gluten-sensitive people. Some people who think they’re sensitive to gluten may instead be sensitive to wheat, and some of them will be ok with older varieties of wheat. But the gluten in old wheats is just as much of a problem for people sensitive to gluten as the gluten in new wheats. I suspect this would work fine with white spelt flour, especially if you can find refined spelt flour for bread. Um wowwww this is so amaaaaazing, girl!!!! I’m both mad and happy about it because I can’t believe I never thought of it or tried this method before….Also, it’s so beautiful and a fun excuse to use the pasta maker, weee! Whoaaaaaa what a fabulous pastry for the weekend! This looks mad delicious. Awesome creation! Absolutely GENIUS! Finally something to do with my pasta machine other than make pasta.. although that’s what it’s made for ;) And, girl, obsessed with your pictures!! at the end of each link you have a video… It’s really typical, if you ever go to Naples please taste some! These look magnificent and you make it seem so simple with a pasta machine great idea. I’m with joy- still can’t quite picture what you are doing after you roll up 1 log with the butter. Do you make a thicker log by rolling the two pieces together? That doesn’t sound right. Maybe you could show a picture of what you mean by that step. Sorry to be dense about this, but I am planning on making these. I made your layered rolls with crushed peanutds before and they were the most amazing thing, so I have a feeling if I can figure this out, this will be a really mind-blowing technique for me to learn. Thank you! This is genius! And as always beautiful. 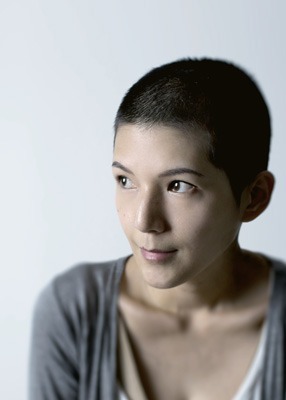 I love you work Mandy, congratulations on the saveur nomination. Well, it’s official. You are a genius! Speechless. Your are the Madame Curie or Thomas Edison of Food. A true visionary and a century ahead of your peers. The world is a much tastier place with you in it:) Thanks for marrying so many cuisines and making the approachable and truly delectable. ABSOLUTELY BRILLIANT. In total shock at how genius this is!! YES to everything about this post. Mandy you are a genius! Holy crap. This is genius. I think you just totally changed the croissant world for the better. So, now that i left them to rise, some of my notes. When i put them on top of each other, they were too thick to put into a knot. So i just layed them overlapping and then turned them. Mine were slightly dry, not sure if its cuz of the flour or anything else.Lets hope they come out as pretty as yours. Emma, how much water did you add. I ended up adding all 160 grams of water. I figured out how to make 8. I did add all the water required. Is it possible i went overboard with the flouring while using the pasta machine??? That’s highly possible. Because the dough is so thin, it will dry out if you use too much flour during the “pressing”. Oozing cheese wouldn’t be a bad start would it? These are stunning. I don’t even eat muffins (or croissants) and these have me debating that decision. you are absolutely brilliant. pure genius! Oh. My. God. How devilish of you to simplify the laminated dough process. Now Im going to be eating Cruffins on the regular! :-S why is my first comment still awaiting moderation? Is it for the links? Anyway, can I make you a bizarre request? Could you please measure the diameter of the holes of your muffin pan? I know, I am a pscychopat, but I have the feeling that my old muffin tin is too small… Thanks! Oh sorry I wasn’t aware there was a pending comment!! It’s on now! The muffin hole is about 7 cm. Oh man. I am staring at my pasta maker right now with a ‘it’s on’ kind of look. Amazing! I can’t wait to try this. Do you think these could be modified to mimic Tartine’s Morning Buns (brown sugar, cinnamon, orange zest)? Or something along those lines? Or would just adding demerara sugar make them caramelized? How would you do it? Magnificent! I will do them ASAP….meanwhile a little question: no sugar at all? How should I do do make them sweet, leaving proportions perfectly balanced, could you give me suggestions? Thanks a lot! Stefania, they are a bit savory, but only because I want them to kinda function like a croissant. If you wanna make them more dessert like, you can reduce the salt to 1/2 tsp, then add 2 tbsp of sugar in the dough. GENIUS! BRILLIANT!! All the amazing words in the dictionary. I’m obsessed with the idea of cruffins and I love that you made them without folding and chilling!! This is so creative and the photography is on point. Can’t wait to try this, thank you! This is entirely amazing. More encouragement to buy the pasta maker attachment thingy I’ve been wanting. This is absolutely earth shattering! I can totally feel the flakiness of it all through these photos. Crying and drooling simultaneously. Completely unrelated but coincidental to my personal events today…Mr. Holmes Bakehouse on Larkin Street in San Francisco, known for his Cruffin selection, was subject to theft in early March. The thief only stole recipes from the establishment and most news coverage consistently referenced the missing Cruffin recipe. Wow! Leilani, I read that article, too!! Hahhaaa too funny. You are the Cruffin rockstar! Lateral thinking and super creative. Love it. Kathryn, after you divide the dough into 4 and roll 1 portion out, it will be long (see the diagram), therefore you have to cut it in half. But you still roll both “sections” into 1 log, then cut into 2. So you’ll get 8. Does the diagram clear things up for you? I don’t know how I have never thought of making anything other than pasta in my pasta machine.I feel many windows of opportunities opening up…! These came out beautifully, I never thought I could laminate dough in so little time. I would like to make the dough itself a little sweeter, so do you have any suggestions on how to do that? I was thinking either substitute a little flour for some powdered sugar, or sprinkle on some powdered sugar on top of the butter layer? Noah, reduce the salt to 1/2 tsp, then add 2 tbsp sugar to the dough-mix :) Then like real cruffins, maybe stuff some pastry cream inside! This is mind blowing! You are ah mah zing… this I will have to try soon and put some almond paste during the rolling or on top of the cruffin ? Bicil, let me know how it turns out! Oh “Lady”, you elemental broody goddess of the kitchen, you’ve done it again ! 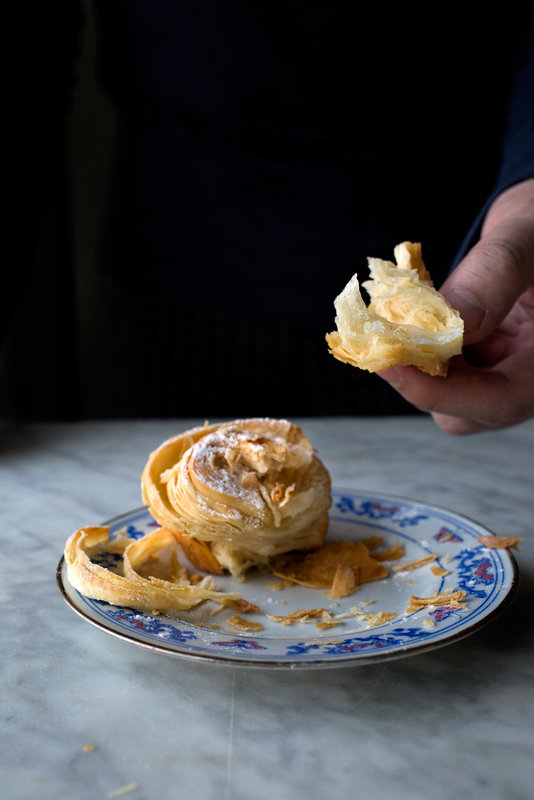 it’s as if different worlds collided … a flaky brioche like in Paris, a muffin like in North America, a miniaturized greek filo pastry factory in your own home …. the result: MAGIC ! i will give it a try :) thank-you and take care, g-tsak. 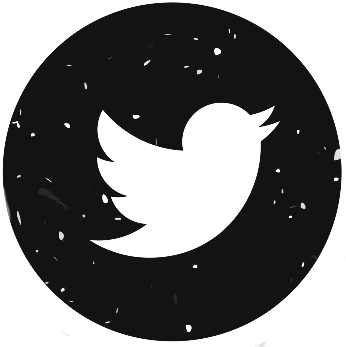 When I came across your site last night, I was intrigued and wanted to try this. And yup, I bought a pasta machine this afternoon, and I will keep you posted what’s the outcome of my cruffins. Oh, I am thrilled and beyond excited!!!! Kim, it was a gift so I have no idea! but I assume it can be found on amazon? What’s the tool you’re using in the 2nd and 3rd pictures? Verbena, OH hahaa those are the dough-hooks from my hand-held mixer! Congratulations. You inspired me. Today I got out my pasta machine after almost 5 years in the closet. How genius are these? They look so light and flakey. They really need to be in my kitchen. . .like right now. I’m inlove with these… I’m going to have to ask for my Pasta machine back from my sister just so I can make this! Oh my dear Lord! THIS IS BRILLIANT. You are my hero. they look super yummy, but are they really as light/flaky/scrumptious as “traditional” croissants? with traditional puff pastry/croissant recipes, you fold into thirds, rotate, fold into thirds, and repeat those 2 folds 2-3 times more. that gives several hundred or even thousands of layers (729 for 2 repeats and 6561 for 3 repeats to be precise). is rolling up the dough enough to replicate the beautiful original? Leven, haha good question. 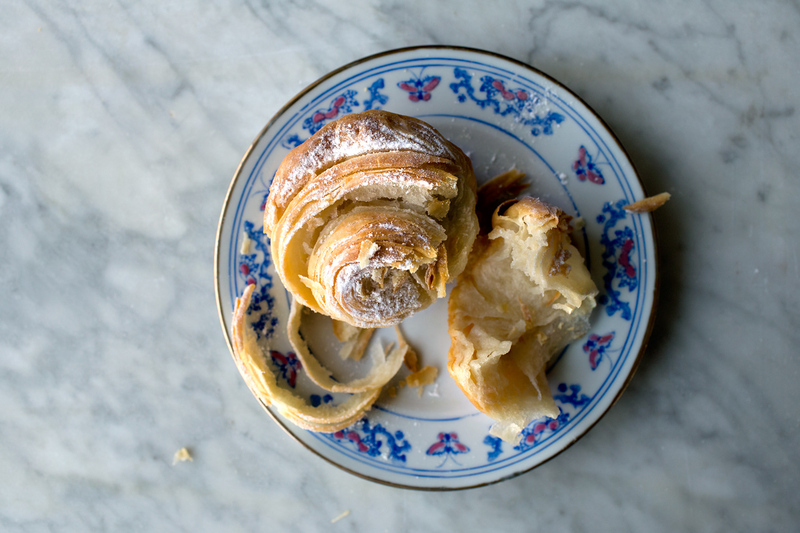 The goal here is not to replace the original croissant recipe, or to say this is better. That’s why I didn’t say “better croissant this way”. The recip offers an alternative to ppl who may be short on time, or looking for an alternative to the traditional ways. Cruffins are a popular invention from a bakery in San francisco, and I don’t think their cruffin, filled with pastry Cream, are completely identical to the traditional croissant either. The point is to have fun, as a process, to wherever it may take us. If we all just stick to tradition, what’s the point of cooking anymore? Just wanted to let you know that I added cinnamon sugar and turned them into morning bun cruffins. They are delicious and addictive! I just posted them on my blog. Looks scrumptious. 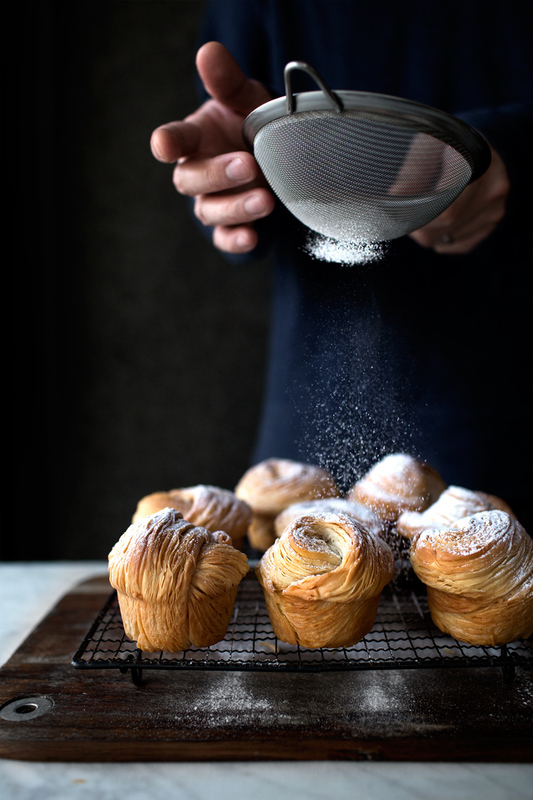 Step 1) acquire a pasta maker step 2) make cruffins. 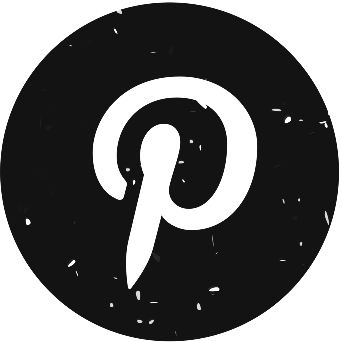 I think divine guidance led me to your wonderful unique treats blog/w’s… thank you for sharing with us. 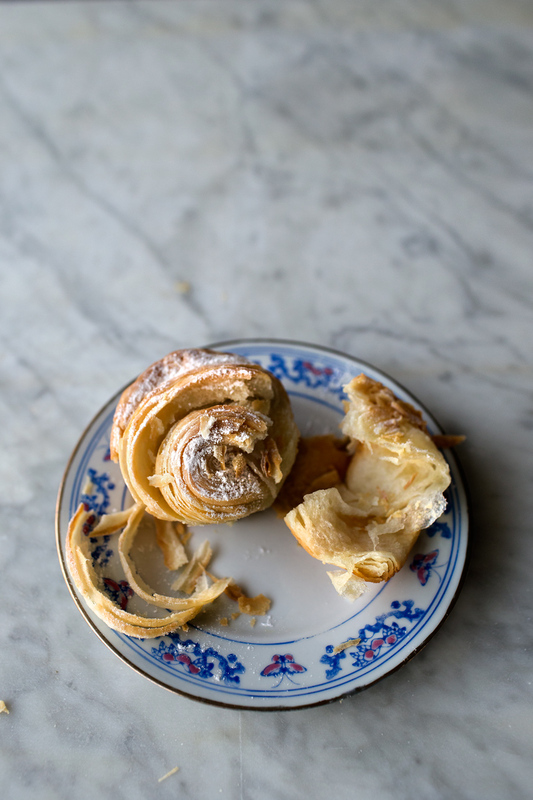 This is brilliant and employs the same technique used to make the classic sea shell Italian pastry sfogliatelle. While not yeasted, the pastry is rolled in the pasta machine, spread with lard and dotted with candied citron. 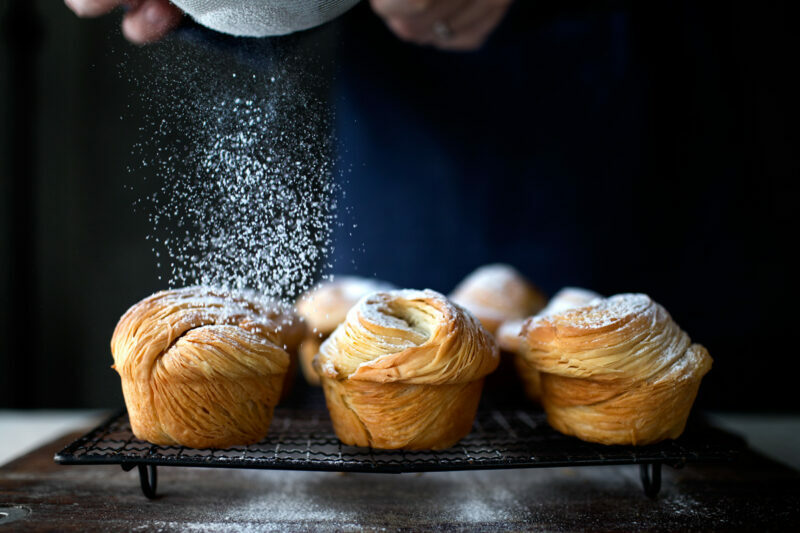 It is rolled up in the same fashion then sliced into discs and folded into a clamshell – but this cruffin recipe tempts me to not only make cruffins but to attempt to make sfogliatuffins. Josy, I’ve never tried freezing them before, so I don’t know how good they will remain after reheating (in the oven I suppose). If you want to put custard in them (like the ones in San Francisco), reduce the salt and add sugar to the dough (read the notes below the recipe). I suppose you’ll have to cut an opening on top. I’ve been considering getting a pasta machine and this just sealed the deal. I HAVE to make these!!!! I love the diagram too. Thanks for the great recipe! 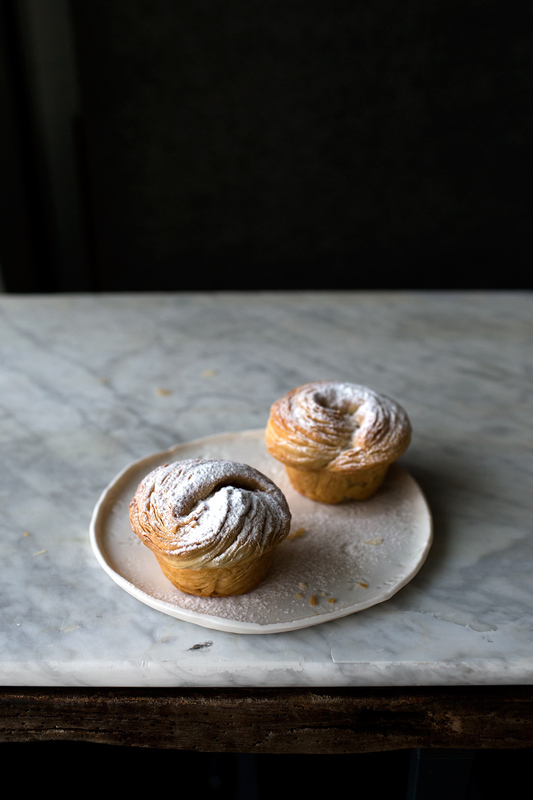 I filled the centre of my cruffins with almond frangipane – highly recommend! Made them! They are fantastic! And we used pure butter for some, and 2 frangipan, 2 vanillecream. Just Mmm… Thanks for the nice pic’s and recepie! These look amazing!!! Will make them next week. My ? : would this dough make a “cronut” (if deep fried)? You can use this recipe for the dough and butter, but apply them using the “speed folding” technique in the link. If you ever try to do it, report back and let us know how it goes! Hi, can you tell me if the filling can be spread on pastry before its rolled up or this the filling placed in the centre? They look amazing Thank you. Patricia, what kind of filling? If you are referring to pastry cream, you can fill it with a piping bag after they’re baked. Thanks for the recipe Mandy. Love how detailed your instructions are too. My cruffins are currently proving, so can’t wait to try them! I must say the hardest part of the recipe is smearing the butter onto the super thin dough without causing any tears – a step that demands lots of patience! I just finished….waiting for them to rise! Thank you so much for the illustrations! I can’t wait to eat them. Using the pasta machine, was a stroke of genius! Amazing! Love these…they make waking up…necessary! I’ve made these twice now in less than a week, I think I’m obsessed. Thank you.Much easier than making croissants. I made this yesterday – great flavor but a couple of comments. Mine came out very crunchy/crispy. My dough didn’t rise enough during the second proof. I think what I’ll change next time is that I will activate the yeast in the water required before adding it to the dough. I normally do for any bread recipe, but I figured I would give these instructions a try first. I added the sugar that you recommended and that made it just sweet enough, I liked that. Brad, thanks for the feedback! Yes I made the same mistake of not final-proofing enough, and the bread was crunchy and tough. I would really wait for the dough to at least fully double before baking. Dissolving the yeast first is a good way to speed things up. In your recipe it says bread flower but what kind? Loes, any high-gluten flour for breads/pizzas should do. Your cruffin recipe was a great incentive to purchase a pasta machine. I was finally able to make the cruffins (activating the yeast first before adding it to the dry ingredients) and they turned out amazingly. I’ll be sure to post them on my IG and credit you of course. Once again, thank you for sharing your creative recipes! This is amazing. I tried it a few times (the second time with a few changes) and added some spices like vanilla, tonka and lemon zest to the butter. It came out beautiful and it was really fun to make. Hi Mandy, Thanks again for your brilliant cruffin recipe! 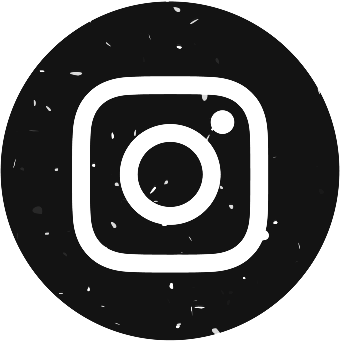 I just posted a chocolate version of the cruffin on my IG account and credited you for the recipe. 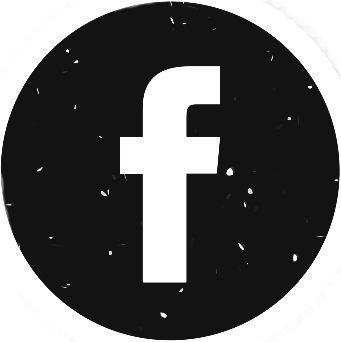 I know you’re busy, but I would be so grateful for your feedback. You’re such an inspiration and it would mean the world to me. Thank you! Hi Mandy, thanks for the recipe. However, I am looking at the conversation and may think it’s wrong or I just don’t know any better. Can you verify re dry yeast and also the salt? Thanks a million! If I want to freeze a cruffin, I must do before baking the cruffin? … Or, should I freeze it once baked. Hey there! I know I’m late to the party, lol, but just wanted to thank you for this friggin awesome recipe! I can’t wait to try this, and I agree with others that this is pure genius! This is a great recipe. My lessons from making them are not to stint on swathing the butter over the dough. I thought I had the dough covered enough on the first batch but didnt use anywhere near as much butter as suggested here and they were okay but not mega. Next time I used the recommended amounts even though this was very buttery indeed and this somehow made the open layers at the top crisper and the central sections more good-croissant like when baked. Also when it comes to rubbing the butter over the dough because the dough is so fine and easily splitable at this stage I found it easier to put the first amounts down the centre of the dough and then use my fingers to gently move it to the edges. Secondly, do what Mercedes says and be patient and leave these babies till they do double in size – I had no trouble with the yeast in achieving this and following this recipe without prior fermantation. I baked the first batch too soon and though still good they werent a patch on the second ones which look just like the ones in the pictures here and taste great. I love these with home made jams but I am now itching to shake cinnamon sugar over the pasta sheet before the role up to see if we get a mega cinnamon bun as the earlier poster has suggested – its not like anyone contemplating these is going to be that concerned about calories……are they? Tenore, thanks for these awesomely detailed feedbacks!!! Apologies for getting my Mercedes and Mandy’s mixed up – I should also have added that I do the version with less salt and a small amount of sugar added to placate (and doubtless, plaque) my sweet tooth but I probably wouldnt do that if ever I give the cinnamon cruffin version a go…..
Now on to tackling the awesome looking Walter White….you have some amazing ideas on here Mandy and both the commentaries and the photographs are exemplary. This may have already been asked … But… I will ask again. What is the best storage method for these? Can I freeze them ( before or after baking)? Dsar, I didn’t like them when they were frozen and re-baked, so I would suggest freezing the dough after it was twirled/shaped and 80% proofed, then give it a few hours (2~4 depending on the room temperature) before baking to defrost and fully double, then bake. ok, they just came out of the oven and they are half gone. Took the advice about reducing the salt, adding a little sugar to the dough, and brushing with an egg wash before sprinkling with a little sanding sugar. OUTSTANDING RECIPE. Light, flaky, delicious- and the whole pasta machine hack is brilliant- thanks! 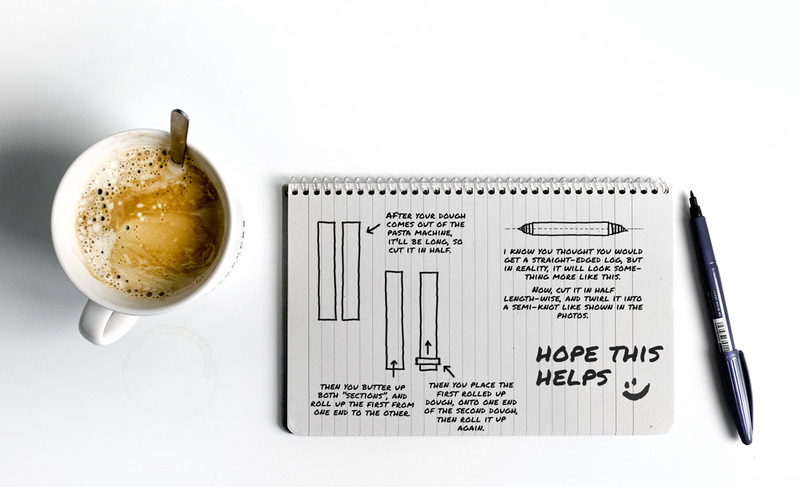 I am going to be making this, this weekend… I think that you may have left out one step in the pictures. after you have rolled up the dough like a cigar… don’t you have to cut the dough lengthwise to expose the layers of the prospective cruffin? that way you would have 2 parts..out of 1? Sorry if I may have missed a similar question earlier, but for some reason, without looking really closely at the pictures, I couldn’t figure out how the layers got in it. Am I correct? I can’t wait to make this..
Deb, the photos didn’t include every single steps, so I would refer to the diagram which does show cutting the dough lengthwise to expose the layers :) Good luck! just making them now… i see that you did in fact explain it. I was just not understanding.. but, I did get it.. Mea culpa. they are looking good, I am so impressed that I could do this. Thanks for the recipe! Are you meant to prove them again if you put them in the fridge the day before? I made these last night, but I think I misunderstood the instructions. If I want to cook these first thing in the morning for warm breakfast should I be proving them in a warm place over night, rather than in the fridge? I don’t want to get up in the middle of the night to get them out of the fridge. Any help will be gratefully received, because they looked amazing just really tiny! Emma, did they expand in the fridge overnight (they should have and that should’ve been the proofing)?? Sounds like yours didn’t proof in the fridge at all. What I would do is, before putting them in the fridge the night before, let them proof at room-temperature for 1~2 hours first to get a head start. Let me know if this helps! Oops, forgot the check mark. Can’t wait to get your ideas! This is brilliant! Do you think I could use this method to make a croissant? Perhaps after rolling the dough into the tube, I can use a rolling pin to roll it out into a rectangle, and cut it from the top right to the bottom left to create that triangle and roll it up like a croissant? When you first posted this I knew I had to try to make it. I finally did yesterday. OMG I can’t believe it worked. Your instructions where spot on and it came out perfect. This is my best baking success evah!! Thank you for sharing, I will be baking these for friends at Christmas time. Brilliant, finally putting my pasta machine to good use. Made some yesterday and making a second batch today, taste amazing. 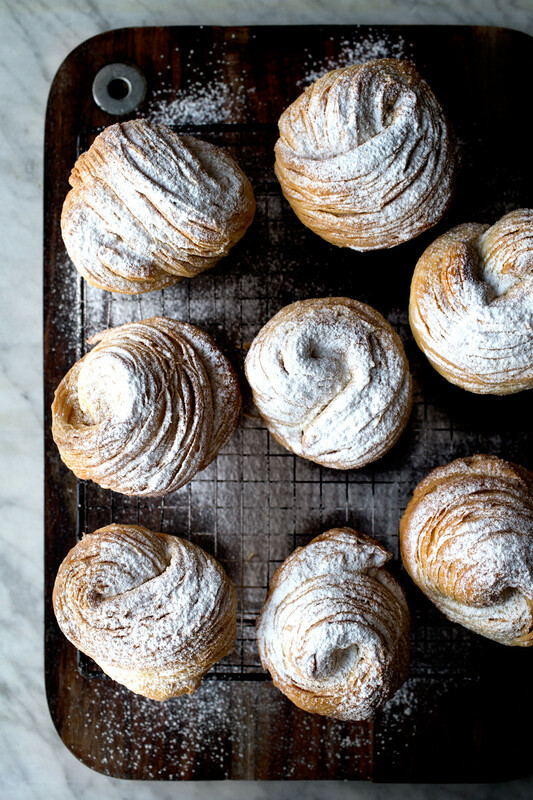 I’d like to make Cruffins for Christmas morning and was wondering if I could make them the night before and leave them to proof overnight in a warm room instead of the fridge? Belinda, sorry just to be more specific, I would let them proof for 1:30 hour at room-temperature first (to get a head-start), then leave them in the fridge (gently covered in plastic-wrap) overnight. Hi! The photos taken of these pastries are simply beautiful. I was wondering if I could use one of them (specifically the one of you sifting flour) for a school project (personal use). I would make sure to give this blog all the credit. Let me know, thanks! These look wonderful! I will try them although I am low carb due to pre-diabetes. But the process will be fun! Wow! These are gorgeous! I also love all the photos and instructions! I have been reading food blogs all my life and never felt inclined to comment. Bow down to you, praise be. So smart!! Made these this morning. I followed the recipe exactly, except I don’t have a stand mixer so I did it all by hand. The dough was extremely tight at first, so I added a few teaspoons of water to incorporate all the flour. Mixing in the butter by hand got very messy — at first I thought I’d already ruined the dough, but I kept going and it came together very nicely. When rolling the dough in the pasta maker, I didn’t bother connecting the ends to make one continuous strip. It was easy enough to cut the strips in half and run them through a few times. The end result was PInterest-worthy. The cruffins were a little chewier than I expected, and certainly savory, as described. Now that I’ve successfully made the recipe once, I’m thinking of making roasted garlic parmesan ones, as well as sweet ones, maybe with a Milo or Nutella paste if I can figure out how to make it. Hey thanks so much for this recipe, the instructions/diagram were perfect… Made the sweet variation for my friend’s birthday and piped in some lemon curd (recipe from epicurious) since she likes lemony desserts… So so good and beautiful. I feel like these are -made- to be filled… Gooey center, crisp exterior with flaky, tender layers in between… Will definitely have to try some variations of this concept. I used my kitchen aid pasta attachment and had to abandon the genius circular pasta feeding idea… takes some practice on an electric machine (and maybe bc it’s so high off the counter too? )… Just wanted to mention that in case anyone else has trouble with that… They still turned out beautiful even though the ends of my pasta sheets were not perfectly square. Mandy, I completely understand your panic over your hair – it’s not the hair, it’s the personal loss that’s the real obsession. I’ve lost my beloved husband of 41 years. During the last two months I spent at his bedside, the stress & worry did cause my hair (& eyebrows) to start falling out & now a biopsy does confirm that a rare form of scarring alopecia means that the eyebrows (now all gone) & my hair (2/3 gone, so far) is never coming back. I am becoming a master of penciling on the brows & wearing wigs. We soldier on without the ones we’ve loved, whether people or sweet pet/best friends, but the body has reminded us how deeply we’ve cared. really I love them. they are similar to the Neapolitan sfolyatelle but this one lower in calories and faster :) Thank you ! Can this recipe be easily doubled? I’m having 9 for brunch on Sunday and I know 1 is not enough per person. I ordered a pasta roller today on line and can’t wait to get baking! Sharon, I don’t see why not :) Good luck with the brunch party!! Can the recipe be doubled easily? I’m going to make these for Sunday brunch and I know one is not going to be enough per person. Also was it difficult to crank the pasta roller while keeping a continuous loop of dough? Oops sorry but didn’t see that my previous comment went through. Thanks for the answer and I will take pictures. Fingers crossed. Quite similar to kubaneh https://food52.com/recipes/66596-uri-scheft-s-yemeni-kubaneh in execution, though these are a lot crisper and flakier. Very nice. I made the mistake of adding more water, so it was similar to other bread doughs, which made it much more difficult to work with the pasta machine (tearing really easily, sticking to itself as it comes out…). The end result was great, but I think I made a lot more work for myself. How long will they last after baking? Or how long is the dough able to be kept uncooked? Hannah, like all pastries, they should be eaten within a few hours after baking. I’m not sure I understand the second question though. Can you explain a bit. Oh My! At last, wonderful pics and a great diagram! Other Cruffin sites are so confusing. So glad to have found yours. I’ll be making these very soon and I know I’ll be successful because of your very clear directions. Thank you! So having made these I think the technique is amazing, expensive if you don’t have a pasta machine but amazing. The final look of them would give the impression that they were made in a fancy patisserie. However the overall taste was underwhelming. I agree with several of the commentators here. It needs something more. Things like chocolate, jams, jellies all made it harder for proofing but ham and cheese for savory I found to work a lot better. Raisins and currants sprinkled on top of the butter and then rolled up worked equally as well. All of this said the version of the recipe you gave with the added sugar worked out a little better. After you put them in a fridge over night, can you pull them out bake them right away or do you have to keep them in a room temp for some time?